I wonder if it started with the “War by the Shore” in 1991. Something about the Ryder Cup matches of the 1990s seems to have set off Shirley D. Durham, and it’s not just the way the spectators behaved, either. The change in attitude shown by the professional golfers themselves, at least in the matches pre-September 11, apparently inspired Durham to write Mr. Ryder’s Trophy (Sleeping Bear; $22.95). It’s an intriguing novel of manners and sportsmanship. Durham is an accomplished portrait artist, amateur golfer, and past committee member of the USGA. Her first novel addresses several related themes, while centered around two essential mysteries concerning the origins of the Cup: why did Sam Ryder create and sponsor this international competition, and who is the golfer appearing on the top of the famous award? Answering these questions led Durham to create an inspired historical novel that is at once a ghost story, a character study, a travelogue of southeast England, and an argument about the morally proper way to play one of life’s greatest games. The action starts in 1976, when Mr. and Mrs. Steven Winchester find themselves transferred to England for Steve’s job managing a factory north of London. Mrs. Winchester discovers that St. Albans, the little town where they are renting, includes a fine golf club. In addition, this very club was the favorite of Sam Ryder. His portrait hangs in the clubhouse, and as she stares at it she finds herself caught up in a conversation with the old man, now long dead. The situation is just sufficiently bizarre that she accepts it. She also prudently avoids letting her husband and friends in on the secret of her new acquaintance. Besides, Ryder has so much to discuss with her, well beyond his personal history. It seems that Ryder and his long-time friend and professional golfer, Abe Mitchell, have decided that this American woman should help restore the Ryder Cup to its originally intended purpose—to give an opportunity for excellent competition among professional golfers, in an atmosphere of sportsmanship and camaraderie. By 1976, there are signs that what Ryder intended, especially on behalf of British and Irish golfers, may not last much longer without significant changes. After the initial series of great contests, by the mid-70s the matches were becoming far too one-sided. The Americans were running roughshod over their counterparts from GB&I. Something needed to be done before others decided there was no point in continuing the competition. As befits the actions of ghostly creations, Ryder and Mitchell eventually disclose how and under what conditions Jack Nicklaus will be “inspired” to suggest the creation of a European squad in lieu of the more limited field. There’s far more to it than that, however. Ryder makes sure Mrs. Winchester knows that she will eventually provide an influential spark to help alter some other aspects of the Cup that will need attention. In addition, Mrs. Winchester learns more about Sam Ryder, St. Albans and the surrounding community. Readers discover with her the nuances of afternoon tea, the impact of broad-scale landscape architecture on the British countryside, and additional background on Abe Mitchell, one of the now lesser-known but nonetheless influential golfers of the early 20th century. Mrs. Winchester becomes convinced that there’s a connection between Mitchell, Walter Hagen, and the golfer on the lid of the Ryder Cup. Her investigation of this possibility is one of the more sustained pieces in the entire novel, and her arguments coalesce nicely as the book concludes. 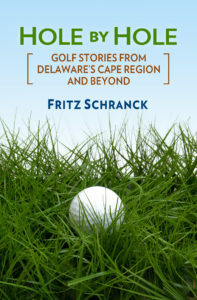 Unlike some other golf books, this novel will appeal primarily to truly avid golfers with a sense of history and an interest in what one might call the morality of golf. Nonetheless, unlike some other golf books, there are no wasted words here. This is a well-edited work of fiction, in which the pieces come together with no sense that the reader was forced to travel useless paths. It’s simply a very good first novel.